Alan Rewitzer, a student at Winona State University in Winona, Minn., and member of the Madison Scouts, recently received a scholarship from the Hal Leonard Corporation. 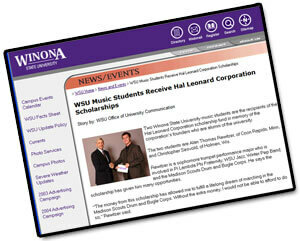 The Hal Leonard Corporation scholarship is awarded in memory of the corporation's founders who are alumni of Winona State. Recipients must be enrolled full time at the university, be part of the music program and maintain a grade point average of at least 3.0. Rewitzer points to the scholarship as a reason why he is able to participate with the Madison Scouts. Read about Rewitzer's accomplishment on www.winona.edu.